The attorneys of Sheller, P.C. believe in giving back to the community where they work, live, and grow. The many “good works” of these dedicated professionals are noted on their individual pages and below. 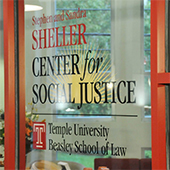 The Sheller Center for Social Justice at Temple University Beasley School of Law serves as a hub of social justice inquiry and advocacy for Temple law students and faculty. Responsive to community needs, its projects enable groups disadvantaged by poverty and discrimination to seek justice through systemic change. The Sheller Center was created in 2013 through a $1.5 million gift from Stephen and Sandra Sheller. Building on Temple’s long-standing and deep commitment to social justice, the Sheller Center works in collaboration with Temple Law faculty and students, community groups, the Philadelphia and Pennsylvania legal communities, and other schools and departments within Temple University to improve access to justice for underserved populations in Philadelphia and across Pennsylvania. 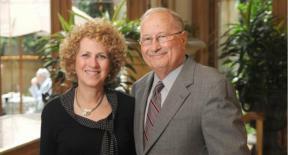 In 2018, the Shellers made an additional $1.5 million gift to Temple Law in order to further support the success The Sheller Center for Social Justice has had locally and nationally in its five years of existence. The Sheller 11th Street Family Health Services Center of Drexel University has been recognized as a national model of innovative care by the Robert Wood Johnson LEAP project (Learning from Effective Ambulatory Practices), the Agency for Heatlhcare Research and Quality, and the American Academy of Nursing. The Center broke ground June, 2014. The mission of the Stephen and Sandra Sheller 11th Street Family Health Services is to provide quality, comprehensive “patient first” health services to the clients it serves, with special attention to vulnerable people and residents of public housing units in the 11th Street Corridor. In addition to its direct services mission, 11th Street provides an exemplary model of nurse-managed, community-based care for the education of health professions students and for faculty practice. Through a $2.5 million gift, the Center uses a transdisciplinary approach to deliver primary care, behavioral health, dental services, and health and wellness programs to more than 2,500 adult patients annually. Adults and children have a single point of access for care that addresses both the physiological and psycho-social aspects of the person and family. Opened in June 2016, this new “living room” area of The Free Library of Philadelphia allow library patrons to gather with their friends and participate in library program. As a member of the board of Trustees of both Drexel University and Pennsylvania State University, Stephen Sheller serves in leadership/advisory roles and task forces. At Penn State, he has served on a variety of committees and in advisory roles. At Drexel, he is on the School of Law Board of Overseers and the Advisory Board for the Drexel University Nursing and Healthcare Professions. The Shellers served in multiple leadership roles for the Salvation Army, including the Executive Committee, Advisory Board, and on the Leadership Cabinet as Campaign Chair charged with the creation of the $100 million Ray and Joan Kroc Center built in North Philadelphia. For their support and dedication, the Shellers were honored at the 128th Anniversary Celebration of the Salvation Army with the “Others Award,” given to those who exhibit extraordinary service on behalf of others and exceptional service to the Army and community. The Stephen and Sandra Sheller Emergency Disaster Service Command Center, built on the Salvation Army’s Divisional Headquarters campus in Philadelphia, will be instrumental in providing emergency response services during natural and manmade disasters. The Salvation Army provides help to those in their greatest time of need. Disaster relief staff and trained volunteers provide food, shelter, clothing and emotional/spiritual support to those affected by disasters. The “Civilian in Peace, Soldier in War” is a permanent exhibit at The National Liberty Museum in Philadelphia honoring the Pennsylvania National Guard. The PA National Guard is the oldest Guard Unit in the nation, tracing its origin all the way back to a militia established by Benjamin Franklin. Stephen Sheller is frequently commended for his service to the Pennsylvania National Guard. He was recognized by Raymond T. Odierno, then U.S. Commanding General for Iraq, for his continued support of, and dedication to, the Guard and specifically to the troops of Operation Iraqi Freedom. General Odierno sent Mr. Sheller a flag that had flown over the U.S. Embassy in Iraq and a plaque of merit. The Shellers endowed scholarships for “at risk” students. The scholarships are administered by the Pennsylvania State System of Higher Education. Lauren Sheller’s pro bono involvement in immigration includes obtaining permanent resident status for a client and a case before the Second Circuit Court of Appeals. Other pro bono work includes involvement in efforts supporting the Violence Against Women Act. Jamie Sheller and her son Dane are involved in the “Our Closet” volunteer organization. Clothing is made available to vulnerable Philadelphians free of charge at “pop-up shops” throughout the city.